When Jorge Luís Borges says that his life would be over if his accident left him incapable of writing literature, there's a feeling of devotion to art that finds ressonance in other great artists. His vision can be romantic to others, among those is the writer Edgar Allan Poe. In 1946 the essay “Philosophy of composition” was published in the Graham's Magazine, on it he not only questions this “inspiration” but also explain how his creative method can work in such a calculated manner. The Beauty presents itself in the poem through the dead lover and form this come the extreme melancholic tone. Poe sees the melancholy as “the most legitimate of all the poetical tones”. And why a raven? When he chose the word “nevermore” as a conductor of the poem he needed to create a way to insert it's repetition. It could be a parrot, but the raven was more adequate to the melacholic tone and fit his desire for repetition because he knew it had to be an animal able to speak in some manner, since a person wouldn't work in the poem if she was to say the same thing over and over again. To create this underlying suggestiveness he uses the first metaphoric expression “myheart” proposing a emblematic image of the raven that only reaches it's full meaning in the end of the poem representing the “Mournful and Never-ending Remembrance”. 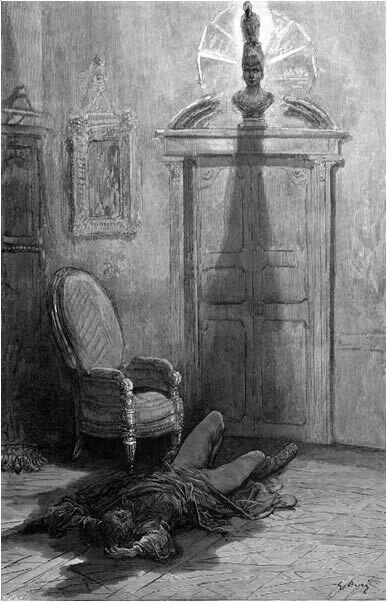 The Raven illustrated by Gustav Doré. Shall be lifted — nevermore." Old fashioned? Frigid? Maybe, but his importance to literature is undeaniable. With this honest exposure of his writing process, Edgar Allan Poe also make visible the daily effort behind the creative works we appreciate. And is there any problem in writing like this if the result if “The Raven”? So many years passed and there's still people making mistakes that he can teach how to avoid in “Philosophy of composition”. Another interesting tip is to read interviews as a easier way to study and gather information. If you want to forget some of this cold-hearted calculation of the poem I recommend readingsome of what Lygia Fagundes Telles has to say about the mission of the writer.